This article examines the received wisdom of services marketing and challenges the validity and continued usefulness of its core paradigm, namely, the assertion that four specific characteristics—intangibility, heterogeneity, inseparability, and perishability—make services uniquely different from goods. An alternative paradigm is proposed, based on the premise that marketing exchanges that do not result in a transfer of ownership from seller to buyer are fundamentally different from those that do. It posits that services offer benefits through access or temporary possession, instead of ownership, with payments taking the form of rentals or access fees. This rental/access perspective offers a different lens through which to view services. Important implications include opportunities to market goods in a service format; the need for more research into how time is perceived, valued, and consumed; and the notion of services as a means of sharing resources. Cet article examine la sagesse reçue du marketing des services et conteste la validité et l’utilité continue de son paradigme de base, à savoir l’affirmation selon laquelle quatre caractéristiques spécifiques — intangibilité, hétérogénéité, inséparabilité et caractère périssable — rendent les services différents des marchandises. Un paradigme alternatif est proposé, basé sur la prémisse que les échanges commerciaux qui n’entraînent pas un transfert de propriété du vendeur à l’acheteur sont fondamentalement différents de ceux qui le font. Il postule que les services offrent des avantages par l’accès ou la possession temporaire, au lieu de la propriété, avec des paiements prenant la forme de loyers ou de frais d’accès. Cette perspective de location/accès offre une optique différente pour visualiser les services. Les implications importantes comprennent les possibilités de commercialiser des marchandises dans un format de service ; la nécessité de plus de recherches sur la façon dont le temps est perçu, valorisé et consommé ; et la notion de services comme moyen de partage des ressources. Some scholars have expressed concern that existing service concepts are not readily applicable to Internet services. Brown (2000) argued that “the ability to obtain and consume services without interacting with a human provider challenges much of our existing knowledge” (p.62). Reinforcing this viewpoint, D.E Bowen (2000) concluded, “It now seems that the most of what we know about services marketing and management has been derived from the study of face-to-face services encounters or at least over the telephone” (p.46). On remarque que le concept de service est difficilement dissociable de l’humain. Ainsi, dès lors que l’on veut introduire un service par internet uniquement, le côté humain devient plus “fragile” et le service en est impacté. 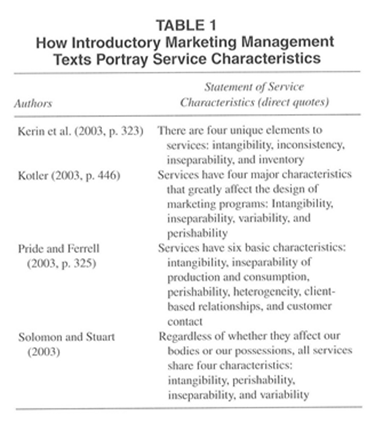 As argued by Schneider (2000), the underlying paradigm in services marketing since the 1980s has been that services are different from goods, a claim supported by an in-depth literature review by Fisk, Brown, and Bitner (1993), who concluded that “[four] features – intangibility, inseparability, heterogenicity, and perishability [IHIP]– provided the underpinnings for the case that services marketing is a field distinct from goods marketing” (p68). Pride and Ferrell claim two more: client-based relationships and customer contact. Intangibility is not only the most widely cited difference between goods and services but has also been described by Bateson (1979) as the critical distinction between physical intangibility, that which is impalpable or cannot be touched, and mental intangibility, that cannot be grasped mentally, and concluded. “The crucial point about services is that they are doubly intangible” (p.139). Laroche, Bergeron and Goutaland (2001) argued that intangibility includes third dimension, generality (which encompasses the notions of accessibility versus inaccessibility to the senses, abstractness versus concreteness, and generality versus specificity) and develop a scale for measuring all three dimensions. Kerin et al. (2003) stated that services „can’t be held, touched, or seen before the purchase decision” and are thus more difficult to evaluate (p.323). Yet many services involving delivery of tangible elements can be evaluated before use. For instance, the core product in a hotel or motel is the room. Travelers can check out hotel or motel rooms before registering and may even decide to try another facility if they do not like the look of the facilities, the appearance and attitude of the staff, or even the feel of the bed. On peut également citer dans le secteur de l’hôtellerie, et cela pendant la prestation de service, plusieurs éléments tangibles qui peuvent l’influencer positivement. Par exemple, à l’arrivée des clients, ceux-ci peuvent recevoir des cadeaux de bienvenue (chocolats, petits accessoires …). Ainsi, les éléments tangibles peuvent accompagner le service. 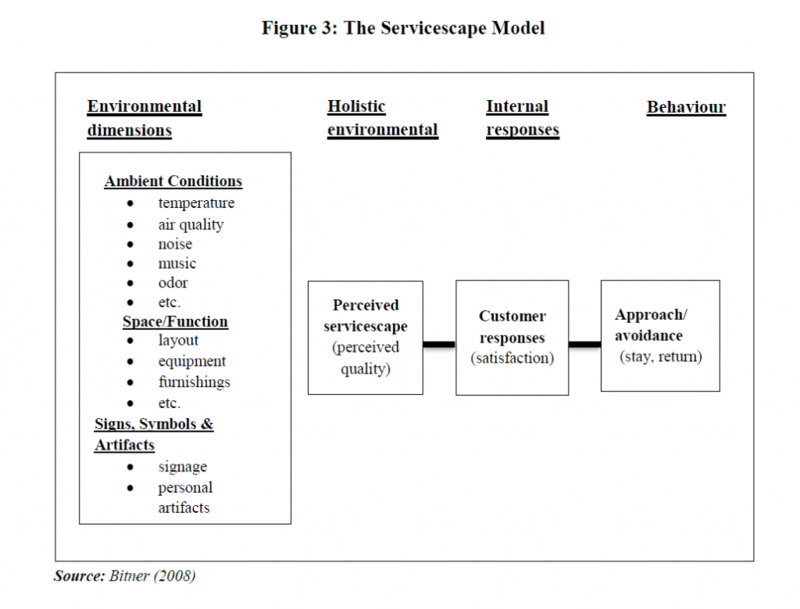 An important concept relating to service tangibility is the servicescape, which recognizes that service experiences are surrounded and shaped by a built environment incorporating ambience, function, and design in addition to a social environment comprising service providers and other customers (Bitner 1992, 2000). Eiglier and Langeard (1975, 1977) noted the difficulty of controlling service quality when customers are actively involved in the production process. Separable services. Despite the inseparability claim for services, there is a large group of separable services that do not involve the customer directly, with the result that production and consumption need to be simultaneous. Simple observation will show that numerous widely used business and consumer services delivered to customers physical possessions – such as transporting freight, laundering clothes, and undertaking routine cleaning and maintenance on a wide array of equipment and facilities – are most commonly performed in the customer’s absence. On remarque ici que le terme d’inséparabilité n’est pas tout à fait juste car dans le secteur de l’hôtellerie par exemple, bien souvent et même toujours, le service de nettoyage de chambre des clients est effectué lorsque le client est sorti et ne se trouve plus dans la chambre. Cela lui permet de se promener et de retrouver une chambre propre à son retour. Dans ce cas, la production et la consommation du service ne se sont pas effectuées au même moment et pourtant nous sommes bien dans un service pur. Bateson, John E.G. (1979). “Why We Need Service Marketing.” In Conceptual and Theoretical Developments in Marketing. O.C. Ferrell, S.W. Brown, and C.W. Lamb eds. Chicago: American Marketing Association, 131-16. Bitner, Mary Jo (1992), “Servicescapes: The Impact of Physical Surroundings on Customers and Employees.” Journal of Marketing, 56 (April), 57-71. 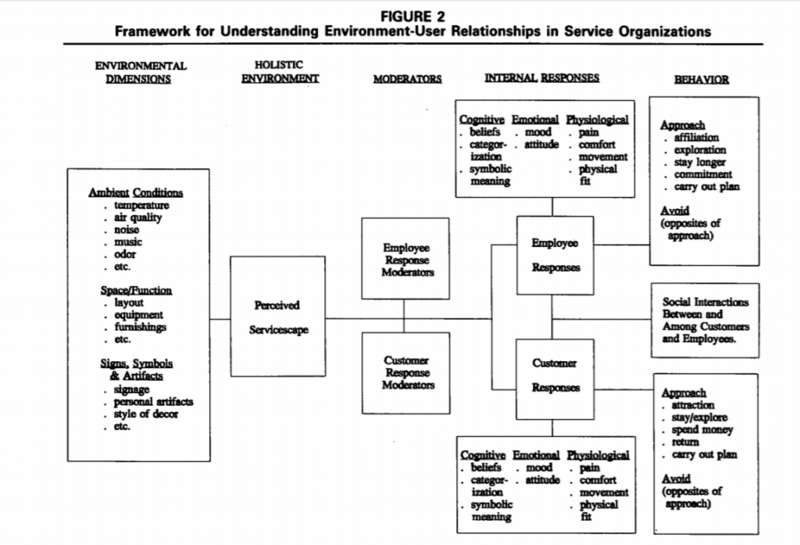 (2000), “The Servicescape.” In Handbook of Services Marketing and Management, T. A. Swartz and D. Iacobucci. eds. Thousand Oaks, CA: Sage, 37-50. Bowen, David E. (2000), Pt.3, in Services Marketing Self-Portraits: Introspections, Reflections, and Glimpses from the Experts, R.P. Fisk, S.J. Grove, and J. John, eds. Chicago: American Marketing Association, 37-51. Brown, Stephen W. (2000), Pt.4, in Services Marketing Self-Portraits: Introspections, Reflections, and Glimpses from the Experts, R.P. Fisk, S.J. Grove, and J. John, eds. Chicago: American Marketing Association, 53-69. Fisk, Raymond P., Stephen W. Brown, and Mary Jo Bitner, (1993), “Tracking the Evolution of the Services Marketing Literature”, Journal of Retailing, 69 (Spring), 61-103. Kerin, Roger A., Eric N. Berkowitz, Steven W. Hartley, and William Rudelius (2003), Marketing, 7th ed. New York: McGraw-Hill. Kotler, Philip (2003), Marketing Management, 11th ed. Upper Saddle River, NJ: Prentice Hall. – and Sidney J. Levy (1969). “Broadening the Concept of Marketing,” Journal of Marketing. 33 (January). 10-15. Laroche, Michel, Jasmine Bergeron, and Christine Goutaland (2001), „A Three-Dimensional Scale of Intangibility.” Journal of Service Research, 4 (August), 26-38. McDougall, Gordon H., and Douglas W. Snetsinger (1990). “The Intangibility of Services: Measurement and Competitive Perspectives.” Journal of Services Marketing, 4(4), 27-40. Pride, William M and O.C. Ferrell (2003), Marketing Concepts and Strategies, 12th ed. Boston: Houghton Mifflin. Schneider, Benjamin (2000), Pt. 9, in Services Marketing Self-Portraits: Introspections, Reflections, and Glimpses from the Experts, R.P. Fisk, S.J. Grove, and J. John, eds. Chicago: American Marketing Association, 173-187. Solomon, Michael R. and Elnora W. Stuart (2003), Marketing: Real People, Real Choices, Upper Saddle River, NJ: Prentice Hall. There are two logics or mindsets from which to consider and motivate a transition from goods to service(s). The first, “goods-dominant (G-D) logic”, views services in terms of a type of (e.g., intangible) good and implies that goods production and distribution practices should be modified to deal with the differences between tangible goods and services. The second logic, “service-dominant (S-D) logic”, considers service – a process of using ones resources for the benefit of and in conjunction with another party – as the fundamental purpose of economic exchange and implies the need for a revised, service-driven framework for all of marketing. This transition to a service-centered logic is consistent with and partially derived from a similar transition found in the business-marketing literature — for example, its shift to understanding exchange in terms value rather than products and networks rather than dyads. It also parallels transitions in other sub-disciplines, such as service marketing. These parallels and the implications for marketing theory and practice of a full transition to a service-logic are explored. Il existe deux logiques ou mentalités à partir desquelles il est possible d’envisager et de motiver une transition de biens en services. La première, la «logique dominante sur les biens», considère les services comme un type de bien (par exemple, incorporel) et implique que les pratiques de production et de distribution de biens doivent être modifiées pour tenir compte des différences entre biens et services tangibles. La seconde logique, la «logique dominante de service», considère le service – un processus d’utilisation de ressources au profit et en liaison avec une autre partie – comme objectif fondamental de l’échange économique et implique la nécessité d’un service révisé. cadre axé sur l’ensemble du marketing. Cette transition vers une logique centrée sur le service est cohérente et partiellement dérivée d’une transition similaire à celle trouvée dans la littérature spécialisée dans le marketing commercial – par exemple, sa transition vers une compréhension de l’échange en termes de valeur plutôt que de produits et de réseaux plutôt que de dyades. Cela correspond également aux transitions dans d’autres sous-disciplines, telles que le marketing de services. Ces parallèles et les implications pour la théorie et la pratique du marketing d’une transition complète vers une logique de service sont explorés. One views goods (tangible output embedded with value) as the primary focus of economic exchange and “services” (usually plural) as either (1) a restricted type of (intangible) good (i.e., as units of output) or (2) an add-on that enhances the value of a good. We (Vargo & Lusch, 2004a; Lusch & Vargo, 2006a) call this logic goods-dominant (G-D) logic. The second logic considers “service” (singular) – a process of doing something for another party – in its own right, without reference to goods and identifies service as the primary focus of exchange activity. We (Vargo & Lusch, 2004a, 2006) call this logic service-dominant (S-D) logic. In S-D logic, goods continue to play an important, service-delivery role, at least in a subset of economic exchange. In S-D logic, service is defined as the application of competences (knowledge and skills) for the benefit of another party. It represents a shift from thinking about value in terms of operand resources — usually tangible, static resources that require some action to make them valuable – to operant resources – usually intangible, dynamic resources that are capable of creating value. The locus of value creation, then, moves from the “producer” to a collaborative process of co-creation between parties. Thus, in S-D logic, goods are still important; however, service is superordinate. We believe that S-D logic can serve as a foundation for a sounder theory of markets and marketing that can, in turn, reduce the divide between academic and applied marketing and thus inform marketing practitioners in their desire to develop a true service focus. Nous avons remarqué qu’il existait deux types de logiques. Les biens et les «services» soit un type restreint de bien (intangible) est la logique dominante des biens (G-D). La seconde logique soit le «service» identifie le service comme le centre principal de l’échange et est appelé une logique à dominante service. Dans la logique S-D, les biens continuent de jouer un rôle important dans la prestation de services. Ainsi, les biens sont toujours importants; Cependant, le service est supérieur. Alderson, Wroe (1957). Marketing behavior and executive action: a functionalist approach to marketing theory. Homewood, IL: Richard D. Irwin. Berry, L. L. (1983). Relationship marketing. In L. L. Berry G. L. Shostack & G. D. Upah (Eds. ), Emerging perspectives on service marketing (pp. 25−38). Chicago: American Marketing Association. Bucklin, Louis P. (1970). Vertical marketing systems. Glenview, Illinois: Scott, Foresman and Company. Canning, Gordon, Jr. (1982). Do a value analysis of your customer base. Industrial Marketing Management, 11, 89−94 (April). Davies, Andrew, Brady, Tim, & Hobday, Michael (2007). Organizing for solutions: Systems seller vs. systems integrator. Industrial Marketing Management, 36, 183−193. Dittrich, Koem, Jaspers, Ferdinand, van der Valk, Wendy, & Wynstra, Finn (2006). Dealing with dualities. Industrial Marketing Management, 35, 792−796. Fern, Edward F., & Brown, James R. (1984). The industrial/consumer marketing dichotomy: A case of insufficient justification. Journal of Marketing, 48, 68−77 (Spring). Gebauer, Heiko, & Fleisch, Elgar (2007). An investigation of the relationship between behavioral processes, motivation, investments in the service business and service revenue. Industrial Marketing Management, 36(3), 337−348. Gronroos, Christian (1983). Strategic management and marketing in the service sector. Cambridge: Marketing Science Institute. Gummesson, Evert (2006). Many-to-many marketing as grand theory: A Nordic school contribution. In R. F. Lusch & S.1. Vargo (Eds. ), The servicedominant logic of marketing: dialog, debate, and directions (pp. 339−353). Armonk, NY: M.E. Sharpe. Hakansson, Hakan, & Ford, David (2002). How should companies interact in business networks? Journal of Business Research, 55, 133−139. Hakansson, Hakan, & Prenkert, Frans (2004). Exploring the exchange concept in marketing. In H. Hakansson, D. Harrison, & A. Waluszewski (Eds. ), Rethinking marketing: developing a new understanding of markets.Chichester, England: Wiley. Hakansson, Hakan, & Snehota, Ivan (1995). Developing relationships in business networks. London: Routledge. Hunt, Shelby D. (2000). A general theory of competition: resources, competences, productivity, and economic growth. Thousand Oaks, California: Sage Publications. Kothandaraman, Prabakar, & Wilson, David T. (2001). The future of competition: Value-creating networks. Industrial Marketing Management, 30, 379−389. Lewis, Marianne W. (2002). Exploring paradox: Toward a more comprehensive guide. Academy of Management Review, 25(4), 760−776. Lingreen, Adam, & Wynstra, Finn (2005). Value in business markets: What do we know” where are we going? Industrial Marketing Management, 34, 732−748. Lovelock, Christopher, & Gummesson, Evert (2004). Wither service marketing?” In search of new paradigm and fresh perspectives. Journal of Service Research, 47, 9−20 (Summer). Lusch, Robert F, & Vargo, Stephen L. (1998). Multiplex retailers versus traditional wholesalers: An empirical test of the total value of the purchase model. International Journal of Physical Distribution & Logistics Management, 28(8), 581−598. Lusch, Robert F, & Vargo, Stephen L. (2006a). The service-dominant logic of marketing: dialog, debate and directions. Armonk, NY: M.E. Sharpe, Inc.
Lusch, Robert F, & Vargo, Stephen L. (2006b). The service-dominant logic of marketing: Reactions, reflections, and refinements. Marketing Theory, 6(3), 281−288. Lusch, Robert F., Vargo, Stephen L., & Obrien, Mathew (2007). 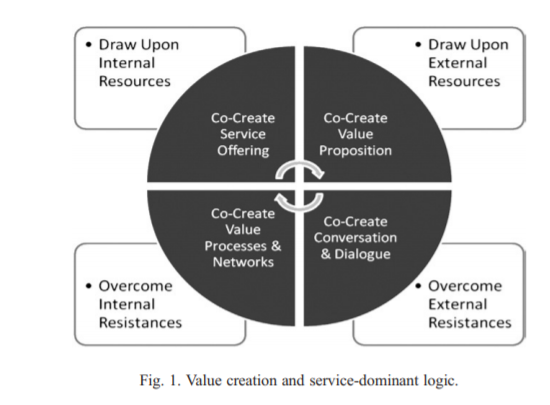 Competing through service: Insights from service-dominant logic. Journal of Retailing, 83(1), 5−18. McCammon, Bert, Jr. (1970). Perspectives for distribution programming. In Louis P. Bucklin (Ed. ), Vertical marketing systems. Glenview, Illinois: Scott, Foresman and Company 1970. Mohan, Reddy N. (1991). Defining product value in industrial markets. Management Decision, 29(1), 14−20. Moller, Kristian (2006). 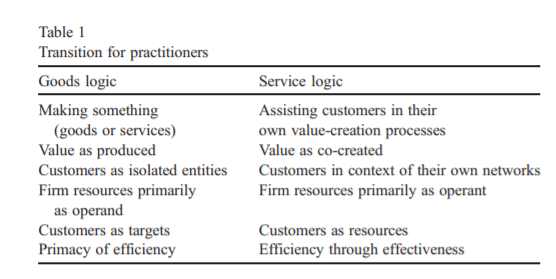 Role of competences in creating customer value: A valuecreation logic approach. Industrial Marketing Management, 35, 913−924. Moller, Kristian, & Torronen, Pekka (2003). Business suppliers. Value creation potential: A capacity-based analysis. Industrial Marketing Management, 32, 109−118. Normann, Richard (2001). Reframing business: when the map changes the landscape. Chichester, New Sussex: Wiley. Phillips, Fred, Ochs, Lyle, & Schrock, Mike (1999). The product is dead — Long live the product-service. Research Technology Management, 42, 51−57 (July–August). Rust, Roland, Zeithaml, Valarie A., & Lemon, Katherine N. (2000). Driving customer equity: how customer lifetime value is reshaping corporate strategy. New York: The Free Press. Smith, Adam (1776/1904). An inquiry into the nature and causes of the wealth of nations. London: W. Strahan and T, Cadell. Ulaga, Wolfgang (2003). Capturing value creation in business relationships: A customer perspective. Industrial Marketing Management, 32, 677−693. Ulaga, Wolfgang, & Eggert, Andreas (2006). Value-based differentiation in business relationships: Gaining and sustaining key supplier status. Journal of Marketing, 70, 119−136 (January). Vargo, Stephen L., & Lusch, Robert F. (2004a). Evolving to a new dominant logic for marketing. Journal of Marketing, 68, 1−17 (January). Vargo, Stephen L., & Lusch, Robert F. (2004b). The four services marketing myths: Remnants from a manufacturing model. Journal of Service Research, 324−335 (May). Vargo, Stephen L., & Lusch, Robert F. (2006). Service-dominant logic: What it is, what it is not, what it might be. In Robert F. Lusch & Stephen L. Vargo (Eds. ), The service-dominant logic of marketing: dialog, debate and directions (pp. 43−56). Armonk, NY: M.E. Sharpe, Inc.
Vargo, Stephen L., & Lusch, Robert F. (2008). “Service-dominant logic: further evolution,” Journal of the Academy of Marketing Science, 36(1), 1−10 (Spring). Vargo, Stephen L., & Morgan, Fred W. (2005). Services in society and academic thought: An historical analysis. Journal of Macromarketing, 42−53 (June). Vargo, Stephen L., Lusch, Robert F., & Morgan, Fred W. (2006). Historical perspectives on service-dominant logic. In R. F. Lusch & S.1. Vargo (Eds. ), The service-dominant logic of marketing: dialog, debate, and directions (pp. 29−42). Armonk, NY: M.E. Sharpe. Webster, Frederick E., Jr. (1992). The changing role of marketing in the corporation. Journal of Marketing, 56, 1−17 (October). Zeithaml, Valarie A., Parasuraman, A., & Berry, Leonard L. (1985). Problems and strategies in services marketing. Journal of Marketing, 49, 33−46 (Spring). Zuboff, Shoshana, & Maxmin, James (2002). The support economy. New York: Penguin. Les conduites de déconnexion apparaissent comme une volonté de maîtrise des technologies de communication. Elles sont toujours ponctuelles et la plupart du temps partielles. Il s’agit de ne pas se laisser envahir par trop d’informations non désirées, d’échapper à un mode d’interpellations incessantes, à l’urgence et à la pression managériale, au contrôle hiérarchique ou à l’impression d’être surveillé. La déconnexion équivaut alors à reprendre souffle et distance, à retrouver son rythme et un temps à soi. Mais elle est aussi parfaitement révélatrice de la figure de l’homme hypermoderne qui ne se contente pas de suivre l’accélération du mouvement moderne (capacité instrumentale à agir rationnellement sur le réel et soif d’inédit et de changement), mais l’interroge au contraire par une réflexivité accrue sur ses choix et dans l’inquiétude qui en résulte. En moins de vingt-cinq ans, nous sommes passés d’un plaisir récent de connexion à un désir latent de déconnexion. Lorsque les portables sont apparus, de même que les premiers ordinateurs personnels, puis l’Internet, le mot d’ordre a été celui de la connexion. Il y a actuellement un revirement de situation. Les personnes sont de plus en plus attirées par une déconnexion totale, un « retour aux sources » qui les apaise. La connexion est perçue de nos jours comme un facteur de stress, plus ou moins directement. Présentées comme synonyme de progrès, d’ouverture, d’expériences créatives inédites et de nouvelles formes de participation citoyenne, les Technologies de l’information et de la communication (TIC) sont alors tellement pleines de promesses que la non-connexion est très vite pensée comme une injustice : d’un côté ceux qui peuvent participer à la globalité de la société en réseau parce qu’ils ont accès aux équipements et connexions, et de l’autre les exclus qui n’ont pas cette possibilité. La connexion comme division de la société en 2 parties à cette période (années 90). La notion de fracture numérique, telle qu’elle a été majoritairement exposée dans les années 1990, désigne cette inégalité et renvoie donc exclusivement à un problème d’accessibilité technique. Les info-riches sont ceux qui bénéficient de l’accès matériel aux réseaux et terminaux adéquats, et les info-pauvres sont ceux qui en sont privés. Au fur et à mesure que, durant la première décennie 2000, les TIC sont adoptées par un pourcentage grandissant de la population (que l’on pense par exemple au taux d’équipement en téléphones portables, qui bondit en France de 4 % en 1997 à 96 % dix ans plus tard ou au pourcentage des internautes parmi la population âgée de plus de 11 ans passant de 22 % en 2001 à 69 % en 2010), le thème de la lutte contre la fracture numérique semble s’estomper. Plusieurs chercheurs (par exemple Van Dijk et Hargittai) dépassent alors la première vision mécanique de la fracture numérique en proposant de prendre en compte les modes d’utilisation et les inégalités qui leur sont liées et qui renvoient non plus à une seule inégalité (avoir ou ne pas avoir accès aux TIC), mais à des inégalités multiples (savoir-faire et bénéfices). Par exemple, toutes les personnes qui possèdent un téléphone portable n’ont pas toutes les mêmes moyens financiers pour s’en approprier un. Ainsi, certaines auront accès à des fonctionnalités que les autres n’auront pas. L’inégalité face aux TIC n’est donc plus d’en avoir ou pas mais est bien plus complexe que cela. De plus, même en ayant les mêmes modèles, elles n’auront pas forcément les capacités d’utilisation. Ce n’est pas parce qu’il y a accès qu’il y a usages équivalents et ce n’est pas parce qu’il y a usages qu’il y a appropriations également bénéfiques. Mais la seconde fracture numérique elle-même ne parvient pas à rendre compte d’un autre phénomène qui, entre-temps, semble s’être emparé des « riches » de la première facture numérique : une sorte de nausée télé-communicationnelle et de fatigue technologique se traduisant par un désir de déconnexion. Lorsque celle-ci (la déconnexion) se donne à expérimenter, elle est rarement totale (abandon définitif de la technologie), la déconnexion est plutôt segmentée (dans certaines situations et à certaines heures) et partielle (seuls certains usages sont suspendus). Elle est portée par des personnes qui ne sont ni en difficulté économique (au contraire, elles appartiennent en majorité aux couches moyennes et supérieures), ni culturellement marginalisées (elles ont toutes un diplôme, un emploi et mènent plusieurs activités sportives ou culturelles), ni en déficit cognitif face aux technologies (elles les manipulent depuis des mois ou des années). Il est donc hors de question de les classer, selon une logique diffusionniste, parmi ceux qu’Everett Rogers (1983) appellerait des « retardataires ». Pas plus que parmi ceux qui, vivant ruptures ou changement dans leur vie, en viennent à abandonner l’usage de ces technologies. Au contraire, il s’agit la plupart du temps de personnes parfaitement intégrées, très connectées et sachant parfaitement utiliser ces technologies. Bien plus : ce sont souvent de gros usagers utilisant depuis longtemps ces technologies qui en viennent à adopter des conduites de déconnexion ! Les premières études (Jauréguiberry, 2003, 2005) menées sur ces pratiques de déconnexion ont permis de dépasser cette apparente contradiction en posant l’hypothèse de la surcharge informationnelle. C’est parce qu’il y a trop de branchements, trop de connexions, trop d’interpellations, trop de simultanéité, trop de bruits et trop d’informations qu’un désir de déconnexion apparaît. Ce sont les plus adeptes des TIC qui finissent donc par avoir fortement envie de déconnexion et de calme. Cette déconnexion partielle peut être une envie de connexion plus contrôlée et gérée par les utilisateurs finalement. La déconnexion volontaire n’est pas seulement une sorte de fuite alimentée par un désir de souffler, de reprendre son rythme ou de préserver un temps à soi. Elle vise aussi, ne serait-ce que quelques heures, à se mettre à l’écart du monde, à prendre de la distance afin de « faire le point » et de « se retrouver ». Moment ou période de dialogue de soi à soi, de réflexivité, de confrontation avec le sens de sa vie, la déconnexion est alors vécue comme pratique de son intériorité et renvoie directement, nous en ferons l’hypothèse en fin d’article, à la notion de sujet dans une société hypermoderne. En quelques années seulement et sans que nous n’y prenions vraiment garde, le fait de ne pas répondre immédiatement à son téléphone portable en est venu à devoir être justifié. Il faut s’expliquer, se dédouaner, voire s’excuser de son absence de réactivité. Si la déconnexion relève désormais de la justification, c’est bien que la connexion s’est entre-temps convertie en norme. La connexion est devenue plus que normale aujourd’hui, c’en est presque une obligation. Lorsque l’on appelle quelqu’un dans la journée, on s’attend à ce qu’on nous réponde immédiatement ou qu’on nous rappelle au moins dans la même journée. Sinon, on imagine qu’il s’est passé quelque chose d’anormal et on s’attend à ce qu’on nous fournisse une explication à cette indisponibilité. Ainsi, les expériences de déconnexion de Thierry Crouzet (J’ai débranché, 2011) ou de Susan Maushart (Pause, 2013), qui ont été largement commentées, relèvent d’une tentative d’échapper à une overdose de connexion. Le premier parle de « désintoxication » et de « sevrage », la seconde de « ras-le-bol » et de « désir de faire une pause ». Le désir de déconnexion apparaît dans des situations de saturation, de trop-plein informationnel, de débordement cognitif, de harcèlement ou de surveillance dans lesquelles l’individu se sent dépassé ou soumis. Dans les cas extrêmes de burn-out, le rejet des TIC fait partie intégrante d’attitudes de défense ultimes qui permettent à l’individu de survivre quand il ne peut plus lutter. Il y a des cas de déconnexions volontaires mais également involontaires comme les cas de burn-out etc. qui s’apparentent plus à des maladies reconnues. On remarque également que les déconnexions, qu’elles soient volontaires ou non, sont des réactions à un flux d’informations trop important et souvent non contrôlable. Les conduites de déconnexion volontaire que nous avons observées se situent toutes en deçà de telles réactions extrêmes. Elles visent précisément à éviter de rentrer dans la zone rouge du burn-out et de subir des situations de surcharge informationnelle insupportables. Les déconnexions volontaires apparaissent à partir du moment où le désir de déconnexion va au-delà d’une plainte ou d’une fatigue (« Je suis débordé », « Je n’en peux plus », « Je croule sous les e-mails ») et se traduit par des actions, des conduites et des tactiques effectives. Il s’agit par exemple de mettre sur off son téléphone portable dans certaines circonstances ou plages horaires, de déconnecter son logiciel de courrier électronique en choisissant de ne l’interroger que de façon sporadique, d’accepter de ne pas être constamment branché sur ses réseaux sociaux ou de refuser d’être géolocalisable où que l’on soit. Dans tous les cas, la décision apparaît après une prise de conscience, soit par accumulation (la situation n’est plus tenable, il faut faire quelque chose), soit à la suite d’un incident critique (un événement qui décale d’un coup son point de vue). La déconnexion n’est jamais définitive, mais toujours ponctuelle, partielle et située dans des contextes où « trop » est trop, où « encore » ne fait plus sens et où « plus » devient insupportable… Il ne s’agit pas de renoncer aux TIC, mais d’essayer d’en maîtriser l’usage en instaurant des coupures, des sas temporels, des mises à distance. Comme nous le notions déjà en 2003 (Jauréguiberry, 2003, p. 104) : les nouveaux pauvres des télécommunications ne sont plus ceux qui n’ont pas accès à la connexion, mais ceux qui vivent désormais dans l’obligation de répondre immédiatement et qui ne peuvent donc pas échapper à la situation de vivre dans une sorte d’interpellation continue. De leur côté, les nouveaux riches des télécommunications sont ceux qui ont la possibilité de filtrer et donc d’instaurer de la distance vis-à-vis de cette même interpellation. La déconnexion ne renvoie rien moins qu’au sens de la vie, aux questions existentielles et à la force des engagements. On remarque que, bien souvent, les personnes qui se déconnectent volontairement en profitent pour se retrouver, faire un point avec eux-mêmes, une sorte de dialogue avec soi-même, d’interrogation quant à leur vie, leur direction et leur permet de se poser des questions existentielles. Ce qui est recherché s’inscrit alors dans la même logique de distanciation, de mise à l’écart provisoire, de repos et de silence que l’on peut observer sur le plan professionnel. L’attente, l’isolement et le silence, longtemps combattus, car synonymes de pauvreté, d’enfermement ou de solitude réapparaissent dans ce cadre non plus comme quelque chose de subi, mais de choisi. La déconnexion implique toujours une prise de risque. Le fait même de l’assumer est vécu comme une victoire, victoire sur la crainte de manquer quelque chose, victoire sur la peur de s’ennuyer, victoire de ne pouvoir compter que sur soi. Pris dans un courant d’hyper-sollicitations, un flux continu d’informations, emporté par d’incroyables possibilités en termes de connaissance et de distractions, chacun se trouve plongé dans le mainstream véhiculé par les TIC et en vient à être, comme le décrivait David Riesman (1964) il y a plus de 60 ans de cela, extro-déterminé (c’est-à-dire ayant tendance à adapter de façon tactique ses comportements aux situations rencontrées et au seul regard des autres). CROUZET T. (2011), J’ai débranché, Paris, Fayard. HARGITTAI E. (2002), « Second-Level Digital Divide : Differences in People’s Online Skills », First Monday, vol. 7, n° 4. En ligne : http://firstmonday.org/htbin/cgiwrap/bin/ojs/index.php/fm/article/view/942/864. JAURÉGUIBERRY F. (2003), Les branchés du portable, Paris, PUF. JAURÉGUIBERRY F. (2005), « L’immédiateté télécommunicationnelle », in Ph. Moati, dir., Nouvelles technologies et mode de vie (pp. 85-98), La Tour d’Aigues, Éditions de l’Aube. MAUSHART S. (2013), Pause, Paris, Nil. RIESMAN D. (1964 ), La foule solitaire, Paris, Arthaud. ROGERS E. (1983), Diffusion of innovations, New York, Free Press. A typology of service organizations is presented and a conceptual framework is advanced for exploring the impact of physical surroundings on the behaviors of both customers and employees. The ability of the physical surroundings to facilitate achievement of organizational as well as marketing goals is explored. Literature from diverse disciplines provides theoretical grounding for the framework, which serves as a base for focused propositions. By examining the multiple strategic roles that physical surroundings can exert in service organizations, the author highlights key managerial and research implications. Une typologie des organisations de services est présentée et un cadre conceptuel est mis au point pour explorer l’impact des environnements physiques sur les comportements des clients et des employés. La capacité de l’environnement physique à faciliter la réalisation d’objectifs organisationnels et marketing est explorée. Une littérature de diverses disciplines fournit une base théorique au cadre, qui sert de base à des propositions ciblées. En examinant les multiples rôles stratégiques que l’environnement physique peut jouer dans les organisations de services, l’auteur met en évidence les principales implications en termes de gestion et de recherche. The effect of atmospherics, or physical design and decor elements, on consumers and workers is recognized by managers and mentioned in virtually all marketing, retailing, and organizational behavior texts. Managers continually plan, build, change, and control an organization’s physical surroundings, but frequently the impact of a specific design or design change on ultimate users of the facility is not fully understood. The ability of the physical environment to influence behaviors and to create an image is particularly apparent for service businesses such as hotels, restaurants, professional offices, banks, retail stores, and hospitals (Baker 1987; Bitner 1986; Booms and Bitner 1982; Kotler 1973; Shostack 1977; Upah and Fulton 1985; Zeithaml, Parasuraman, and Berry 1985). Because the service generally is produced and consumed simultaneously, the consumer is “in the factory,” often experiencing the total service within the firm’s physical facility. Le fait que les comportements des individus soit influencer ou impacter par les changements/ modifications physique autour d’eux nous renvoi au sensoriel. Les 5 sens sont le toucher, le gouts, l’odorat, l’ouïe, la vue. Chaque sens peut être impacter différemment par l’environnement physique. De plus, on se rend compte que les entreprises de services sont plus impacté par cela car que les entreprise de produits car le service est co-créer dans l’entreprise par le client et le personnel. De plus, il est simultanément consommer. Un service est intangible, indissociable, variable et périssable. purchase, consumers commonly look for cues about the firm’s capabilities and quality (Berry and Clark 1986; Shostack 1977). Research suggests that the physical setting may also influence the customer’s ultimate satisfaction with the service (Bitner 1990; Harrell, Hutt, and Anderson 1980). in service organizations the same physical setting that communicates with and influences customers may affect employees of the firm (Baker, Berry, and Parasuraman 1988). Research in organizational behavior suggests that the physical setting can influence employee satisfaction, productivity, and motivation (e.g., Becker 1981; Davis 1984; Steele 1986; Sundstrom and Altman 1989; Sundstrom and Sundstrom 1986; Wineman 1986). L’environnement physique impacte à la fois le consommateur/ client mais également l’employer. De plus comme il travaille ensemble pour co-créer ce service il est nécessaire que l’environnement physique impacte positivement les 2 parties. En effet, si l’employé est impacté négativement alors il influera de façon négative sur le consommateur et sur le service réalisé. Because services generally are purchased and consumed simultaneously, and typically require direct human contact, customers and employees interact with each other within the organization’s physical facility. Ideally, therefore, the organization’s environment should support the needs and preferences of both service employees and customers simultaneously. “The way the physical setting is created in organizations has barely been tapped as a tangible organizational resource” (Becker 1981, p. 130). the physical setting can aid or hinder the accomplishment of both internal organizational goals and external marketing goals. à L’hôtellerie est considéré comme un service interpersonnel. Dans ce genre de service on remarque que des les relations entre les individus soit influencé en fonction de l’environnement physique qui les entoure. Ainsi, des rencontres peuvent être plus favorable sous certaines conditions. 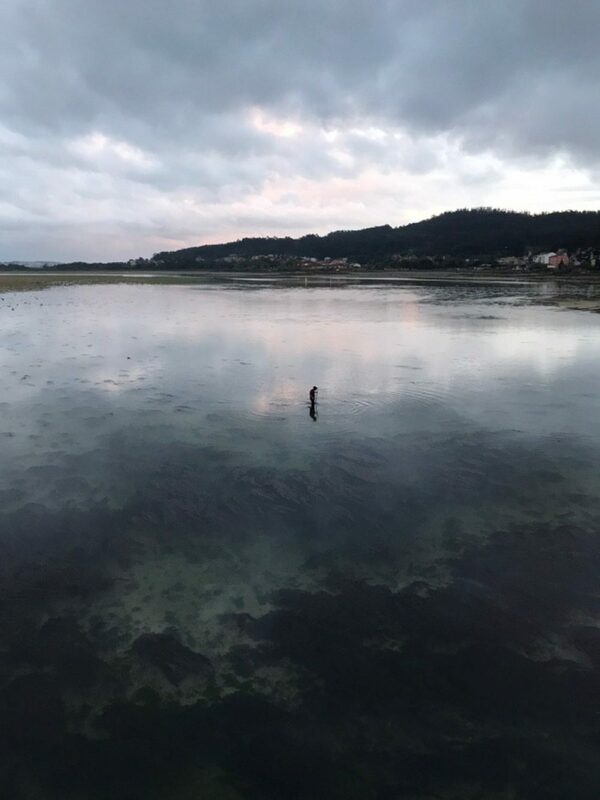 Environmental psychologists suggest that individuals react to places with two general, and opposite, forms of behavior: approach and avoidance (Mehrabian and Russell 1974). Approach behaviors include all positive behaviors that might be directed at a particular place, such as desire to stay, explore, work, and affiliate (Mehrabian and Russell 1974). Avoidance behaviors reflect the opposite, in other words, a desire not to stay, explore, work, and affiliate. Milliman (1982, 1986) found that the tempo of background music can affect traffic flow and gross receipts in both supermarket and restaurant settings. As Figure 2 shows, the approach/avoidance behaviors of employees and customers are determined largely by individual intemal responses (cognitive, emotional, and physiological) to the environment. The three types of internal responses are discussed in greater detail subsequently. The basic assumption is that positive (negative) intemal responses lead to approach (avoidance) behaviors. Bennett and Bennett (1970) state that “all social interaction is affected by the physical container in which it occurs.” They go on to suggest that the physical container affects the nature of social interaction in terms of the duration of interaction and the actual progression of events. Les individus réagissent différemment à l’environnement physique qui les entourent. Leur comportement peut être positif ce qui est appelé « approach » ou de façon négative « avoidance ». Ce comportement/ réaction va refléter l’expérience ressenti par le client lors de son séjour à l’hôtel par exemple. Forgas (1979) suggests that environmental variables such as propinquity, seating arrangements, size, and flexibility can define the possibilities and limits of social episodes, such as those between and among customers and employees. Behaviors such as small group interaction, friendship formation, participation, aggression, withdrawal, and helping have all been shown to be influenced by environmental conditions (Holahan 1982). Examples are again abundant in actual service settings. Even casual observation of a Club Med facility confirms that the highly complex setting is designed to encourage social interaction among and between guests and employees. Seating arrangements and the food preparation process at Benihana restaurants similarly encourage interactions among total strangers, as well as contact between patrons and the Japanese chef who prepares their meals in full view. Nous remarquons que des variables environnementales telles que la proximité, la disposition des sièges, la taille et la flexibilité peuvent définir les possibilités et les limites tels que celles entre les clients et les employés. Elles peuvent également favorisé l’interaction entre les différents clients. Research also suggests that emotional responses to the environment may be transferred to people and/or objects within the environment (Maslow and Mintz 1956; Mintz 1956; Obermiller and Bitner 1984). Cette influence de l’environnement physique sur les individus est une forme de communication non verbale. Elle peut, ainsi, susciter des réactions émotionnelles qui peuvent être capturé en fonction de 2 dimensions : le plaisir-déplaisir et le degré d’excitation. Ainsi ces rections émotionnelles peuvent influer le comportement des individu. Nous avons également pu voir que des réactions émotionnelles peuvent être transmise à d’autres individus ou a des objets. Enfin, ces réactions peuvent être prédites grâce à 3 variables : la complexité, le mystère et la cohérence. The perceived servicescape may also affect people in purely physiological ways. Noise that is too loud may cause physical discomfort, the temperature of a room may cause people to shiver or perspire, the air quality may make it difficult to breathe, and the glare of lighting may decrease ability to see and cause physical pain. A complex mix of environmental features constitute the servicescape and influence internal responses and behaviors. Specifically, the dimensions of the physical surroundings include all of the objective physical factors that can be controlled by the firm to enhance (or constrain) employee and customer actions. Signs have even been found to reduce perceived crowding and stress in a jail lobby setting (Wener and Kaminoff 1982). Other environmental objects may communicate less directly than signs, giving implicit cues to users about the meaning of the place and norms and expectations for behavior in the place. Quality of materials used in construction, artwork, presence of certificates and Photographs on walls, floor coverings, and personal Objects displayed in the environment can all communicate symbolic meaning and create an overall aesthetic impression. Le Servicescape peut affecter un individu du manière physiologie (un bruit qui l’irrite, une odeur qui lui donne la nausée…). Des éléments de l’environnement physique/ servicescape sont des signes qui serve de communication pour les individus. Par exemple : le symbole toilette dans un lieux public ou la direction à prendre pour aller vers la salle de fitness. Ces signaux vont impacter l’expérience clients s’il sont mal positionner ou mal compris par l’individu. De plus, ces éléments peuvent faire ressentir à l’individu quel est la qualité du service qu’il va recevoir. A. Czepiel, Carole A. Congram, and James Shanahan, eds. Chicago: American Marketing Association, 79-84. —,Leonard L. Berry, and A. Parasuraman (1988), “The Marketing Impact of Branch Facility Design,” Journal of Retail Banking, 10 (2), 33-42. Barker, Roger G. (1968), Ecological Psychology. Stanford, CA: Stanford University Press. Bechtel, Robert B., Robert W. Marans, and William Michelson (1987), Methods in Environmental and Behavioral Research. New York: Von Nostrand Reinhold Company, Inc.
Becker, Franklin D. (1977), Housing Messages. Stroudsburg, PA: Dowden, Hutchinson & Ross, Inc.
—-(1981), Workspace. New York: Praeger Publishers. Belk, Russell W., John F. Sherry, Jr. and Melanie Wallendorf (1988), “A Naturalistic Inquiry Into Buyer and Seller Behavior at a Swap Meet,” Journal of Consumer Research, 14 (March), 449-70. —-, Melanie Wallendorf, and John F. Sherry, Jr. (1989),”The Sacred and the Profane in Consumer Behavior: Theodicy on the Odyssey,” Journal of Consumer Research, 16 (June), 1-38. Bell, Paul, J. D. Fisher, and R. J. Loomis (1978), Environmental Psychology. Philadelphia: W. B. Saunders Co.
Bennett, Corwin (1977), Spaces for People, Human Factors in Design. Englewood Cliffs, NJ: Prentice-Hall, Inc.
Bennett, David J. and Judith D. Bennett (1970), “Making the Scene,” in Social Psychology Through Symbolic Interactionism, G. Stone and H. Farberman, eds. Waltham, MA: Ginn-Blaisdell, 190-6. Berry, Leonard L. and Terry Clark (1986), “Four Ways to Make Services More Tangible,” Business (October-December), 53-4. Bitner, Mary Jo (1986), “Consumer Responses to the Physical Environment in Service Settings,” in Creativity in Services Marketing, M. Venkatesan, Diane M. Schmalensee, and Claudia Marshall, eds. Chicago: American Marketing Association, 89-93. Bitner, Mary Jo (1990), “Evaluating Service Encounters: The Effects of Physical Surroundings and Employee Responses,” Journal of Marketing, 54 (April), 69-82. Booms, Bernard H. and Mary J. Bitner (1982), “Marketing Services by Managing the Environment,” Cornell Hotel and Restaurant Administration Quarterly, 23 (May), 35-9. Broadbent, Geoffrey, Richard Bunt, and Charles Jencks (1980), Signs, Symbols and Architecture. New York: John Wiley & Sons, Inc.
Campbell, David E. (1979), “Interior Office Design and Visitor Response,” Journal of Applied Psychology, 64 (6), 648- 53. Crosby, Lawrence A., Kenneth R. Evans, and Deborah Cowles (1990), “Relationship Quality in Services Selling: An Interpersonal Influence Perspective,” Journal of Marketing, 54 (July), 68-81. Darley, John M. and Daniel T. Gilbert (1985), “Social Psychological Aspects of Environmental Psychology,” in Handbook of Social Psychology, 3rd ed.. Vol. II, Gardner Lindzey and Elliot Aronson, eds. New York: Random House Inc., 949-91. Davis, Gerald and Françoise Szigeti (1982), “Planning and Programming Offices: Determining User Requirements,” Environment and Behavior, 14 (3), 302-4, 306-15. Davis, Tim R. V. (1984), “The Influence of the Physical Environment in Offices,” Academy of Management Review 9 (2), 271-83. Donovan, Robert and John Rossiter (1982), “Store Atmosphere: An Environmental Psychology Approach,” Journal of Retailing, 58 (Spring), 34-57. Forgas, Joseph P. (1979), Social Episodes. London: Academic Press, Inc.
Gardner, Meryl P. (1985), “Mood States and Consumer Behavior: A Critical Review,” Journal of Consumer Research, 12 (December), 281-300. —-and George J. Siomkos (1986), “Toward a Methodology for Assessing Effects of In-Store Atmospherics,” Advances in Consumer Research, Vol. 13, Richard J. Lutz, ed. Ann Arbor, MI: Association for Consumer Research 27-31. Golledge, Reginald G. (1987), “Environmental Cognition,” in Handbook of Environmental Psychology, Vol. 1, Daniel Stokols and Irwin Altman, eds. New York: John Wiley & Sons, Inc., 131-74. Griffm, William (1970), “Environmental Effects on Interpersonal Affective Behavior: Ambient Effective Temperature and Attraction,” Journal of Personality and Social Psychology, 15 (3), 240-4. Harrell, Gilbert D. and Michael D. Hutt (1976), “Crowding in Retail Stores,” MSU Business Topics (Winter), 33-9. Holahan, Charles J. (1982), Environmental Psychology. New York: Random House, Inc.
—-(1986), “Environmental Psychology,” Annual Review of Psychology, 381-407. Hui, Michael K. M. and John E. G. Bateson (1990), “Testing a Theory of Crowding in the Service Environment,” Advances in Consumer Research, Vol. 17, Marvin E. Goldberg, Gerald Gom, and Richard W. PoUay, eds. Ann Arbor, MI: Association for Consumer Research, 866-73. —–and —– (1991), “Perceived Control and the Effects of Crowding and Consumer Choice on the Service Expenence,” Journal of Consumer Research, 18(2), 174— 84. Ittelson, William H., Harold M. Proshansky, Leanne G. Rivlin, and Gary H. Winkel (1974), An Introduction to Environmental Psychology. New York: Holt, Rinehart and Winston, Inc.
Kaplan, Stephen (1987), “Aesthetics, Affect, and Cognition,” Environment and Behavior, 19 (January), 3-32. —–and Rachel Kaplan (1982), Cognition and Environment. New York: Praeger Publishers. Kleine, Robert E. and Jerome B. Keman (1988), “Measuring the Meaning of Consumption Objects: An Empirical Investigation,” Advances in Consumer Research, Vol. 15, Michael J. Houston, ed. Provo, UT: Association for Consumer Research, 498-504. Kotler, Phillip (1973), “Atmospherics as a Marketing Tool,” Journal of Retailing, 49 (4), 48-64. Lemke, S., R. Moos, B. Mehren, and M. Ganvain (1979), Multiphasic Environment Assessment Procedure (MEAP): Handbook for Users. Palo Alto, CA: Social Ecology Laboratory. Levine, Marvin, Iris Marchon, and Gerard Hanley (1984), “The Placement and Misplacement of You-Are-Here Maps,” Environment and Behavior, 16 (March), 139—57. Loken, Barbara and James Ward (1990), “Altemative Approaches to Understanding the Determinants of Typicality,” ioMr/ia/o/Con.yM/ncr/fesearc/i, 17 (September), 111- 26. Lovelock, Christopher H. (1983), “Classifying Services to Gain Strategic Insights,” Journal of Marketing, 47 (Summer), 9-20. Maslow, A. L. and N. L. Mintz (1956), “Effects of Esthetic Surroundings,” Journal of Psychology, 1 (41), 247-54. McCaskey, Michael B. (1979), “The Hidden Messages Managers Send,” Harvard Business Review, 57 (November-December), 135-48. McKechnie, G. E. (1974), Manual for the Environment Response Inventory. Palo Alto, CA: Consulting Psychologists Press. Mehrabian, Albert (1977), “Individual Differences in Stimulus Screening and Arousability,” Journal of Personality, 45 (2), 237-50. —-and James A. Russell (1974), An Approach to Environmental Psychology. Cambridge, MA: Massachusetts Institute of Technology. Mervis, C. and E. Rosch (1981), “Categorization of Natural Objects,” Annual Review of Psychology, M. R. Rosensweig and L. W. Porter, eds. Palo Alto, CA: Annual Reviews, Inc. 32, 89-115. Milliman, Ronald (1982), “Using Background Music to Affect the Behavior of Supermarket Shoppers,” Journal of Marketing, 46 (Summer), 86-91. Milliman, Ronald (1986), “The Influence of Background Music on the Behavior of Restaurant Patrons,” Journal of Consumer Research, 13 (September), 286-9. Mintz, Norbett L. (1956), “Effects of Esthetic Surroundings II: Prolonged and Repeated Experience in a ‘Beautiful’ and an ‘Ugly’ Room,” Journal of Psychology, 41, 459-66. Morrow, Paula C. and James C. McElroy (1981), “Interior Office Design and Visitor Response: A Constructive Replication,” Journal of Applied Psychology, 66 (5), 646-50. Nasar, Jack L. (1987), “Effect of Sign Complexity and Coherence on the Perceived Quality of Retail Scenes,” Journal of the American Planning Association, 53 (4), 499- 509. —-(1989), “Perception, Cognition, and Evaluation of Urban Places,” in Public Places and Spaces, Irwin Altman and Ervin H. Zube, eds. New York: Plenum Press, 31-56. Obermiller, Carl and Mary Jo Bitner (1984), “Store Atmosphere: A Peripheral Cue for Product Evaluation,” in American Psychological Association Annual Conference Proceedings, Consumer Psychology Division, David C. Stewart, ed. American Psychological Association, 52-3. Obome, David J. (1987), Ergonomics at Work, 2nd ed. New York: John Wiley & Sons, Inc.
Peters, Thomas J. (1978), “Symbols, Pattems, and Settings: An Optimistic Case for Getting Things Done,” Organizational Dynamics, 1 (Autumn), 3-23. Pfeffer, Jeffrey (1981), “Management as Symbolic Action: The Creation and Maintenance of Organizational Paradigms,” Research in Organizational Behavior, 3, 1-52. Rapoport, Amos (1982), The Meaning of the Built Environment. Beverly Hills, CA: Sage Publications, Inc.
Riley, M. W. and D. J. Cochran (1984), “Dexterity Performance and Reduced Ambient Temperature,” Human Factors, 26 (2), 207-14. Ruesch, Jürgen and Weldon Kees (1956), Nonverbal Communication. Berkeley and Los Angeles: University of Calif omia Press. Russell, James A. and U. F. Lanius (1984), “Adaptation Level and the Affective Appraisal of Environments,” Journal of Environmental Psychology, 4 (2), 119-35. —-and Géraldine Pratt (1980), “A Description of the Affective Quality Attributed to Environments,” Journal of Personality and Social Psychology, 38 (2), 311-22. —- and Jacalyn Snodgrass (1987), “Emotion and the Environment,” in Handbook of Environmental Psychology, Vol. 1, Daniel Stokols and Irwin Altman, eds. New York: John Wiley & Sons, Inc., 245-81. —-and Lawrence M. Ward (1982), “Environmental Psychology,” Annual Review of Psychology, 651-88. Sanders, Mark S. and Emest J. McCormick (1987), Human Factors in Engineering and Design. New York: McGrawHill Book Company. Schmenner, Roger W. (1986), “How Can Service Businesses Survive and Prosper?” Sloan Management Review, 27 (Spring), 21-32. Seidel, A. (1983), “Way Finding in Public Space: The DallasFt. Worth, U.S.A. Airport,” in Proceedings of the Fourteenth International Conference of the Environmental Design Research Association, D. Aneseo, J. Griffen, and J. Potter, eds. Lincoln, NB: Environmental Design Research Association. Sherry, John F., Jr. and Mary Ann McGrath (1989), “Unpacking the Holiday Presence: A Comparative Ethnography of Two Gift Stores,” in Interpretive Consumer Behavior, Elizabeth C. Hirschman, ed. Provo UT: Association for Consumer Research, 148-67. Shostack, G. Lynn (1977), “Breaking Free From Product Marketing,” Journal of Marketing, 41 (April), 73-80. Snodgrass, Jacalyn, James A. Russell, and Lawrence M. Ward (1988), “Planning, Mood and Place-Liking,” in Journal of Environmental Psychology, 8 (3), 209-22. Sommer, R. (1974), Tight Spaces: Hard Architecture and How to Humanize It. Englewood Cliffs, NJ: Prentice-Hall, Inc.
Steele, Fritz (1986), Making and Managing High-Quality Workplaces. New York: Teachers College Press. Stokols, Daniel and Irwin Altman (1987), Handbook of Environmental Psychology. New York: John Wiley & Sons, Inc.
Sundstrom, Eric and Irwin Altman (1989), “Physical Environments and Work-Group Effectiveness,” Research in Organizational Behavior, 11, 175-209. —-and Mary Graehl Sundstrom (1986), Work Places. Cambridge, UK: Cambridge University Press. Szalay, Lorand B. and James Deese (1978), Subjective Meaning and Culture: An Assessment Through Word Associations. Hillsdale, NJ: Lawrence Erlbaum Associates. Upah, Gregory D. and James N. Fulton (1985), “Situation Creation in Services Marketing,” in The Service Encounter, John Czepiel, Michael Solomon, and Carol Surprenant, eds. Lexington, MA: Lexington Books, 255-64. Ward, James C , Mary Jo Bitner, and John Barnes (1992), “Measuring the Prototypicality and Meaning of Retail Environments,” Journal of Retailing, forthcoming. —-, and Dan Gossett (1989), “SEEM: Measuring the Meaning of Service Environments,” in Designing a Winning Service Strategy, Mary Jo Bitner and Lawrence A. Crosby, eds. Chicago: American Marketing Association, 34-9. Ward, Lawrence M., Jacalyn Snodgrass, Barry Chew, and James A. Russell (1988), “The Role of Plans in Cognitive and Affective Responses to Places,” Journal of Environmental Psychology, 8 (1), 1-8. Wener, Richard E. (1985), “The Environmental Psychology of Service Encounters,” in The Service Encounter, John Czepiel, Michael Solomon, and Carol Surprenant, eds. Lexington, MA: Lexington Books, 101-12. —-and Robert Kaminoff (1982), “Improving Environmental Information: Effects of Signs on Perceived Crowding and Behavior,” Environment and Behavior, 14 (6), 671- 94. Whyte, William H. (1980), The Social Life of Small Urban Spaces. Washington, DC: The Conservation Foundation. Wineman, Jean D. (1982), “Office Design and Evaluation,” Environment and Behavior, 14 (3), 271-98. —-(1986), Behavioral Issues in Office Design. New York: Van Nostrand Reinhold Co.
Wohlwill, Joachim F. (1976), “Environmental Aesthetics: The Environment as a Source of Affect,” in Human Behavior and Environment, Vol. 1, Irwin Altman and Joachim F. Wohlwill, eds. New York: Plenum Press. Yalch, Richard F. and Eric Spangenberg (1988), “An Environmental Psychological Study of Foreground and Background Music as Retail Atmospheric Factors,” in Efficiency and Effectiveness in Marketing, 1988 AMA Educators’ Proceedings, Gary Frazier et al., eds. Chicago: American Marketing Association, 106-10. Zeithaml, Valarie (1981), “How Consumer Evaluation Processes Differ Between Goods and Services,” in Marketing of Services, James H. Donnelly and William R. George, eds. Chicago: American Marketing Association, 186-90. Given the importance of ‘Sensory Marketing’ in the field of QSR (Quick Service Restaurant) industry, the objective of this paper is to identify if sensory factors influence customers’ selection of a QSR. Data of 1600 respondents were collected from four international QSRs (KFC, McDonald, Domino’s and Subway) across four cities (Mumbai, Chennai, Bangalore and Hyderabad) of India. Factor analysis revealed three components, namely: Sensory influence, Promotional influence and Monetary influence, due to their high factor loadings. Further, Multiple regression analysis indicated that the Sensory factor contributed significantly to the model followed by Promotional and Monetary Factors. The study concludes that Sensory Factor is the most influencing factor for customers to select a QSR contrary to the general belief of Promotional and Monetary factors. This study adds to theoretical insights of the Sensory marketing literature and also recommends its practical implications to the marketing managers of the QSRs. Compte tenu de l’importance du «marketing sensoriel» dans le secteur des restaurants à service rapide, l’objectif de ce document est d’identifier si des facteurs sensoriels influencent la sélection du QSR par les clients. Les données de 1600 répondants ont été recueillies auprès de quatre QSR internationaux (KFC, McDonald, Domino’s et Subway) dans quatre villes indiennes (Mumbai, Chennai, Bangalore et Hyderabad). L’analyse factorielle a révélé trois composantes, à savoir: l’influence sensorielle, l’influence promotionnelle et l’influence monétaire, en raison de leur forte charge factorielle. De plus, une analyse de régression multiple a indiqué que le facteur sensoriel contribuait de manière significative au modèle suivi des facteurs promotionnels et monétaires. L’étude conclut que le facteur sensoriel est le facteur le plus déterminant pour que les clients choisissent un QSR contrairement aux idées reçues sur les facteurs promotionnels et monétaires. Cette étude complète les connaissances théoriques de la littérature sur le marketing sensoriel et recommande également ses implications pratiques aux responsables marketing des QSR. Sensory marketing; Sensory influence; Quick service restaurant; Multisensory strategies; Experiential marketing; Fast food restaurants. Atwal and Williams (2009) The traditional mass marketing is slowly disappearing and are being replaced by small markets with numerous segments, where individualization and customisation of products and services are key. One consequence is that traditional mass marketing, which once dominated the advertising arena, is being questioned more than ever before in the past as a profitable and productive means to reach customers (Belk, 2008). Of the 5 human senses, the sense of sight has so far dominated advertising practice (Pashler, 1999). There’s without a doubt that the other human senses – odour, taste, sound, and touch – were ignored for quite a very long time, regardless of their significance when somebody considers and determines around a product or brand. five human senses are today receiving increased attention (Katz, 1999). Sensory marketing is not the same as mass or relationship marketing, because it has its long lasting impression in the brain of the individual. Sensory advertising is distinguished by mass and relationship marketing by being its origin in the 5 human senses. It’s from the human mark that mental streams, processes, and psychological reactions take place that results in someone’s sensory experience (Peck and Shu, 2009). Le marketing traditionnelle est de plus en plus remplacé par un nouvelle forme qu’est la personnalisation. Le sensoriel est utilisé dans le marketing et plus particulièrement la vue avec la publicité. Les autres sens ont longtemps été oublié mais aujourd’hui, les marketeurs y font plus attention lors de la mise en place de leurs stratégies. Le marketing sensoriel est différent du marketing de masse mais aussi du marketing relationnel, car l’individu va se remémorer de façon durable l’expérience et cela est imprégné dans le cerveau des individus. The challenge then before entrepreneurs is to know how to stimulate the senses of the consumers in order to provide them with consumption experience that’s perceived to be memorable. This expertise is vital to changing customer behaviour into the goal to buy, which leads to increased sales, profitability and market share. This research concentrates on how sensory advertising influence customer selection of a fast food chain restaurant. 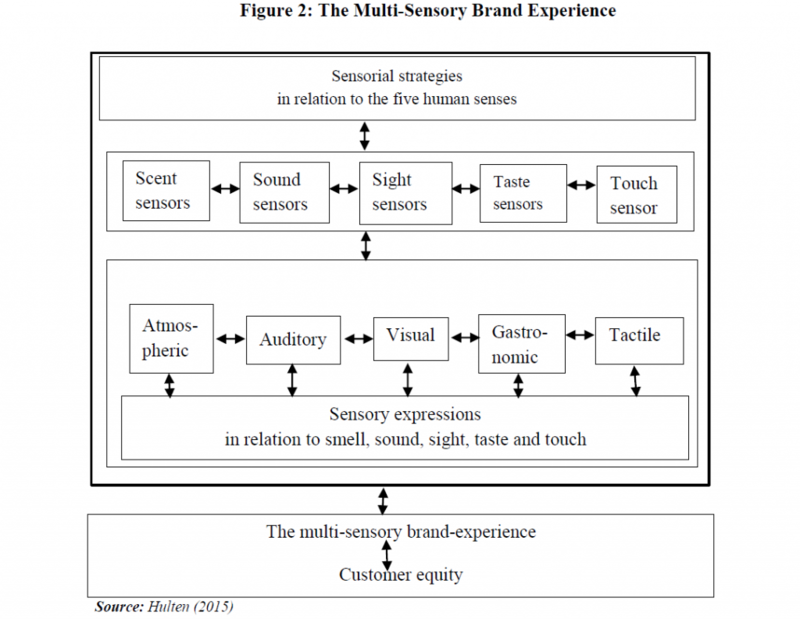 In accordance with the Hultén (2015) model in Figure 2, the task of marketers is to create sensorial approaches that stimulate the senses by producing various sensations. These sensations rotate around the atmospheric, sound, visual, gastronomic and tactile spheres. All of them coalesce to create a multi-sensory brand experience that is vital to creating customer equity. All of them help create a multi-sensory brand experience which is crucial to creating customer equity and loyalty. According to Bennett (2009) Servicescape includes distinct environmental dimensions that are defined as ambient conditions, space/function and signs, symbols & artefacts. These measurements consist of both interior and exterior design, including the surrounding environment in addition to layout, gear and sound, music, odour, lighting all that were identified as factors influencing client’s behaviour. Le but, afin d’avoir une augmentation des ventes, de la rentabilité et des parts de marché, est de savoir comment stimuler les sens des consommateurs afin de leur offrir une expérience de consommation perçue comme étant mémorable. Afin de stimuler les sens il faut produire diverses sensations aux individus afin de créer une expérience client multi-sensorielle qui peut ainsi devenir inoubliable. Ceci peut différentier une entreprise de la concurrence et permet a un individu de devenir un client fidèle. Le servicescape défini que les modifications de l’environnement physique impact les individus et leur comportements. Elle comprend la conception intérieure et extérieure, y compris sur l’environnement, ainsi que sur la disposition, l’équipement et le son, la musique, les odeurs et l’éclairage, facteurs qui influent sur le comportement du client. From the above literature review, it is seen that people perceive their environment through their perceptions. Senses play a major part in influencing their behavior and in their evaluation of the experience. The objective of the study is to identify the key sensory factors that influence customers’ selection of a fast food chain restaurant. Ho: Sensory factors do not influence customers towards the selection of a fast food restaurant. This means that the study has identified three factors influencing the customer’s selection of a fast food restaurant – First influencing factor of restaurant selection is Sensory Factors, the second influencing factor is Monetary Factor and the third influencing factor is Promotional Factor. Les perceptions et les sens des individus jouent un rôle majeur dans l’influence de leur comportement et dans leur évaluation de l’expérience et, ainsi, de leur fidélité à la marque ou non. l’étude a identifié trois facteurs influençant le choix du client d’un restaurant de restauration rapide: le facteur déterminant du choix du restaurant est le facteur sensoriel, le second facteur est le facteur monétaire et le troisième facteur est le facteur promotionnel. Ainsi nous pouvons retenir que le facteur sensoriel est très important sur le choix de l’individu ainsi que le facteur monétaire te le facteur promotionnel. Et nous pouvons utiliser cette étude comme point de départ sur le secteur de l’hôtellerie qui est également un secteur de service au même titre que la restauration rapide. Arnheim, R. (1971). Visual thinking. Berkeley: University of California Press. Atwal, G., & Williams, A. (2009). Luxury brand marketing – The experience is everything! Journal of Brand Management, 16(5), 338–346. Belk, R. W. (1988). Possessions and the Extended Self. Journal of Consumer Research, 15(2), 139–168. Bennett, R. (1996). Relationship formation and governance in consumer markets: Transactional analysis versus the behaviourist approach. Journal of Marketing Management, 12(5), 417–436. Bitner, M. J. (1992). Servicescapes: The Impact of Physical Surroundings on Customers and Employees. Journal of Marketing, 56(2), 57. Fiore, A. M., Yah, X., & Yoh, E. (2000). Effects of a product display and environmental fragrancing on approach responses and pleasurable experiences. Psychology & Marketing, 17(1), 27–54. Harris, L. C., & Ezeh, C. (2008). Servicescape and loyalty intentions: an empirical investigation. European Journal of Marketing, 42(3/4), 390–422. Hultén, B. (2015). 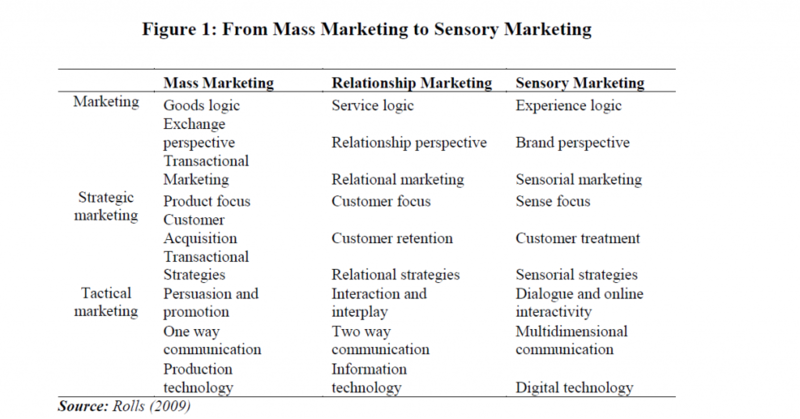 Sensory marketing: Theoretical and empirical grounds. Abingdon: Routledge. Katz, J. (1999). How emotions work. Chicago: University of Chicago Press. Krishna, A. (2011). Sensory marketing: Research on the sensuality of products. Abingdon: Routledge. Lindstrom, M. (2010). Brand sense: Sensory secrets behind the stuff we buy. New York: Simon and Schuster. Pashler, H. E. (1999). The psychology of attention. Cambridge, Massachusetts: MIT Press. Peck, J., & Shu, S. B. (2009). The Effect of Mere Touch on Perceived Ownership. Journal of Consumer Research, 36(3), 434–447. Rolls, E. T. (1999). The brain and emotion. Oxford: Oxford University Press. Simonson, A., & Schmitt, B. H. (1997). Marketing aesthetics: The strategic management of brands, identity, and image. New York: Simon and Schuster. Spies, K., Hesse, F., & Loesch, K. (1997). Store atmosphere, mood and purchasing behavior. International Journal of Research in Marketing, 14(1), 1–17. Turley, L. w., & Fugate, D. L. (1992). The Multidimensional Nature of Service Facilities. Journal of Services Marketing, 6(3), 37–45. Vargo, S. L., & Lusch, R. F. (2008). From goods to service(s): Divergences and convergences of logics. Industrial Marketing Management, 37(3), 254–259. Zeithaml, V. A., & Bitner, M. J. (2003). Services marketing: Integrating customer focus across the firm. New York: McGraw-Hill. Evolving to a New Dominant Logic for Marketing by Vargo, S.L. & Lusch, R.F (2017). Marketing inherited a model of exchange from economics, which had a dominant logic based on the exchange of “goods,” which usually are manufactured output. The dominant logic focused on tangible resources, embedded value, and transactions. Over the past several decades, new perspectives have emerged that have a revised logic focused on intangible resources, the cocreation of value, and relationships. The authors believe that the new perspectives are converging to form a new dominant logic for marketing, one in which service provision rather than goods is fundamental to economic exchange. The authors explore this evolving logic and the corresponding shift in perspective for marketing scholars, marketing practitioners, and marketing educators. Le marketing a hérité d’un modèle d’échange de l’économie, qui avait une logique dominante basée sur l’échange de « marchandises », qui sont généralement des productions manufacturières. La logique dominante portait sur les ressources matérielles, la valeur incorporée et les transactions. Au cours des dernières décennies, de nouvelles perspectives ont émergé qui ont une logique révisée, axée sur les ressources intangibles, la cocréation de valeur et les relations. Les auteurs estiment que les nouvelles perspectives convergent pour former une nouvelle logique dominante pour la commercialisation, l’une dans laquelle la prestation de services, plutôt que les marchandises, est fondamentale pour l’échange économique. 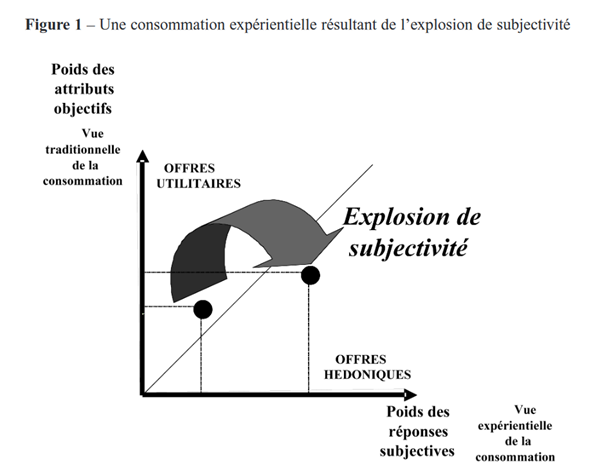 Les auteurs explorent cette logique évolutive et le changement de perspective correspondant pour les spécialistes du marketing, les praticiens du marketing et les éducateurs en marketing. The formal study of marketing focused at first on the distribution and exchange of commodities and manufactured products and featured a foundation in economics (Marshall 1927; Shaw 1912; Smith 1904). The first marketing scholars directed their attention toward commodities exchange (Copeland 1923), the marketing institutions that made goods available and arranged for possession (Nystrom 1915; Weld 1916), and the functions that needed to be performed to facilitate the exchange of goods through marketing institutions (Cherington 1920; Weld 1917). Gummesson (1995, pp. 250–51, emphasis added) states the following: Customers do not buy goods or services: [T]hey buy offerings which render services which create value.… The traditional division between goods and services is long outdated. It is not a matter of redefining services and seeing them from a customer perspective; activities render services, things render services. The shift in focus to services is a shift from the means and the producer perspective to the utilization and the customer perspective. Briefly, marketing has moved from a goods-dominant view, in which tangible output and discrete transactions were central, to a service-dominant view, in which intangibility, exchange processes, and relationships are central. It is worthwhile to note that the service-centered view should not be equated with (1) the restricted, traditional conceptualizations that often treat services as a residual (that which is not a tangible good; e.g., Rathmell 1966); (2) something offered to enhance a good (value-added services); or (3) what have become classified as services industries, such as health care, government, and education. Rather, we define services as the application of specialized competences (knowledge and skills) through deeds, processes, and performances for the benefit of another entity itself. 1950–1980: Marketing Management •Business should be customer focused (Drucker 1954; McKitterick 1957) •Value “determined” in marketplace (Levitt 1960) •Marketing is a decision-making and problem-solving function (Kotler 1967; McCarthy 1960) : Customers do not buy things but need or want fulfillment. Everyone in the firm must be focused on the customer because the firm’s only purpose is to create a satisfied customer. Identification of the functional responses to the changing environment that provide competitive advantage through differentiation begins to shift toward value in use. The marketing literature rarely mentioned “immaterial products” or “services,” and when it did, it mentioned them only as “aids to the production and marketing of goods” (Converse 1921, p. vi; see Fisk, Brown, and Bitner 1993). On remarque que pendant des années, le marketing des services n’était pas reconnu en tant que tel mais était seulement reconnu comme une aide apportée au marketing de biens autrement dit une prestation qui pousserait à l’achat de biens tangibles. The service-centered view can be stated as follows: 1. Identify or develop core competences, the fundamental knowledge and skills of an economic entity that represent potential competitive advantage. 2. Identify other entities (potential customers) that could benefit from these competences. 3. Cultivate relationships that involve the customers in developing customized, competitively compelling value propositions to meet specific needs. 4. Gauge marketplace feedback by analyzing financial performance from exchange to learn how to improve the firm’s offering to customers and improve firm performance. The service-centered view of marketing is customercentric (Sheth, Sisodia, and Sharma 2000) and market driven (Day 1999). This means more than simply being consumer oriented; it means collaborating with and learning from customers and being adaptive to their individual and dynamic needs. A service-centered dominant logic implies that value is defined by and cocreated with the consumer rather than embedded in output. C’est dans cette optique que la notion d’expérience client et de satisfaction client prend tout son sens et découle de l’apprentissage des besoins clients. Le consommateur est un acteur principal dans le marketing des services. Haeckel (1999) observes successful firms moving from practicing a “make-and-sell” strategy to a “sense-and-respond” strategy. Day (1999, p. 70) argues for thinking in terms of self-reinforcing “value cycles” rather than linear value chains. In the servicecentered view of marketing, firms are in a process of continual hypothesis generation and testing. Outcomes (e.g., financial) are not something to be maximized but something to learn from as firms try to serve customers better and improve their performance. 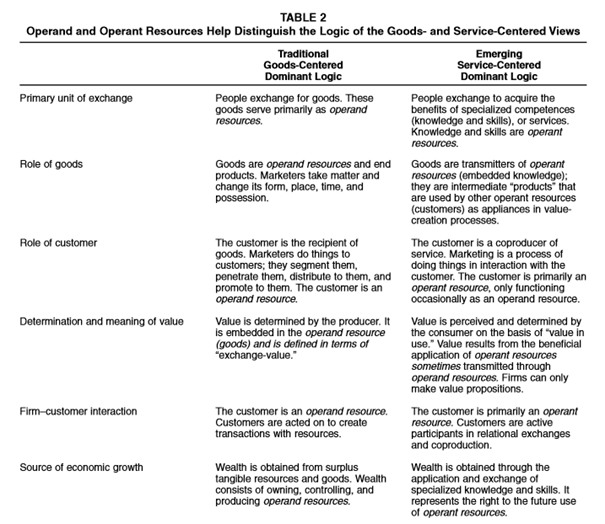 Six differences between the goods- and service-centered dominant logic, all centered on the distinction between operand and operant resources, are presented in Table 2. The six attributes and our eight foundational premises (FPs) help present the patchwork of the emerging dominant logic. Norris (1941, p. 136) was one of the first scholars to recognize that people want goods because they provide services. Par exemple, on ne souhaite pas une ampoule connectée / intelligente dans notre chambre d’hôtel juste pour éclairer la pièce mais pour créer une ambiance, qui plus est, qui nous ressemble. Cette ampoule nous permet donc de personnaliser l’ambiance de notre chambre selon notre humeur ou nos envies et apporte un réel service, bien plus que de la lumière. From a service-centered view of marketing with a heavy focus on continuous processes, the consumer is always involved in the production of value. Even with tangible goods, production does not end with the manufacturing process; production is an intermediary process. Le produit fournit un service mais il faut aussi que le client apprenne à l’utiliser pour pouvoir « profiter » de ce service, sinon il n’y a pas de bénéfices avec ce produit. Likewise, Gronroos (2000, pp. 24–25; emphasis in original) states, Value for customers is created throughout the relationship by the customer, partly in interactions between the customer and the supplier or service provider. The focus is not on products but on the customers’ value-creating processes where value emerges for customers and is perceived by them. Interactivity, integration, customization, and coproduction are the hallmarks of a service-centered view and its inherent focus on the customer and the relationship. Bastiat, Fredric (1860), Harmonies of Political Economy, Patrick S. Sterling, trans. London: J. Murray. ——— (1964), Selected Essays on Political Economy, (1848), Seymour Cain, trans., George. B. de Huszar, ed. Reprint, Princeton, NJ : D. Van Nordstrand. Converse, Paul D. (1921), Marketing Methods and Politics. New York: Prentice Hall. Day, George (1999), The Market Driven Organization: Understanding, Attracting, and Keeping Valuable Customers. New York: The Free Press. Drucker, Peter F. (1954), The Practice of Management. New York: Harper and Row. Fisk, Raymond P., Stephen W. Brown, and Mary Jo Bitner (1993), “Tracking the Evolution of the Services Marketing Literature,” Journal of Retailing, 69 (Spring), 61–103. Gronroos, Christian (2000), Service Management and Marketing: A Customer Relationship Management Approach. West Sussex, UK: John Wiley & Sons. Gummesson, Evert (1995), “Relationship Marketing: Its Role in the Service Economy,” in Understanding Services Management, William J. Glynn and James G. Barnes, eds. New York: John Wiley & Sons, 244–68. Gutman, Jonathan (1982) “A Means–End Chain Model Based on Consumer Categorization Processes,” Journal of Marketing, 46 (Spring), 60–72. Haeckel, Stephen H. (1999), Adaptive Enterprise: Creating and Leading Sense-and-Respond Organizations. Boston: Harvard School of Business. 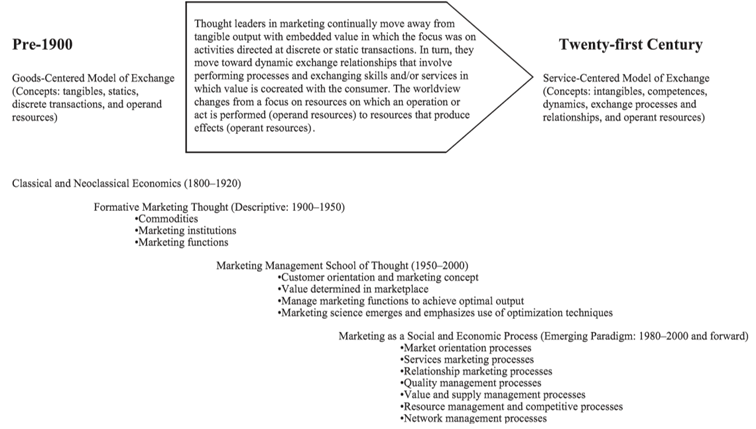 Kotler, Philip (1967), Marketing Management Analysis, Planning, and Control. Englewood Cliffs, NJ: Prentice Hall. Levitt, Theodore (1960), “Marketing Myopia,” Harvard Business Review, 38 (July–August), 26–44, 173–81. Marshall, Alfred (1927), Principles of Economics, (1890). Reprint, London: Macmillan. McCarthy, E. Jerome (1960), Basic Marketing, A Managerial Approach. Homewood, IL: Richard D. Irwin. McKitterick, J.B. (1957), “What Is the Marketing Management Concept?” in Frontiers of Marketing Thought and Science, Frank M. Bass, ed. Chicago: American Marketing Association, 71–81. Norris, Ruby Turner (1941), The Theory of Consumer’s Demand. New Haven, CT: Yale University Press. Nystrom, Paul (1915), The Economics of Retailing, Vols. 1 and 2. New York: Ronald Press. Prahalad, C.K. and and Venkatram Ramaswamy (2000), “Co-opting Customer Competence,” Harvard Business Review, 78 (January– February), 79–87. Rathmell, John M. (1966), “What Is Meant by Services?” Journal of Marketing, 30 (October), 32–36. Rifkin, Jeremy (2000), The Age of Access: The New Culture of Hypercapitalism, Where All of Life is a Paid-For Experience. New York: Putnam. Shaw, A. (1912), “Some Problems in Market Distribution,” Quarterly Journal of Economics, 12 (August), 703–765. Sheth, Jagdish, Rajendra S. Sisodia, and Arun Sharma (2000), “The Antecedents and Consequences of Customer-Centric Marketing,” Journal of the Academy of Marketing Science, 28 (Winter), 55–66. Smith, A. (1904), An Inquiry into the Nature and Causes of the Wealth of Nations, (1776). Reprint, London: Printed for W. Strahan and T. Cadell. Weld, Louis D.H. (1916), The Marketing of Farm Products. New York: Macmillan. (1917), “Marketing Functions and Mercantile Organizations,” American Economic Review, 7 (June), 306–318. The Effect of Mere Touch on Perceived Ownership by Peck, J., & Shu, S. B. (2009). This research finds that merely touching an object results in an increase in perceived ownership of that object. For nonowners, or buyers, perceived ownership can be increased with either mere touch or with imagery encouraging touch. Perceived ownership can also be increased through touch for legal owners, or sellers of an object. We also explore valuation of an object and conclude that it is jointly influenced by both perceived ownership and by the valence of the touch experience. We discuss the implications of this research for online and traditional retailers as well as for touch research and endowment effect research. Cette recherche montre que le simple fait de toucher un objet entraîne une augmentation de la propriété perçue de cet objet. Pour les non-propriétaires ou les acheteurs, la propriété perçue peut être augmentée avec un simple toucher ou avec un toucher qui encourage l’image. La propriété perçue peut également être augmentée par le toucher pour les propriétaires légaux ou les vendeurs d’un objet. Nous explorons également l’évaluation d’un objet et concluons qu’il est conjointement influencé à la fois par la propriété perçue et par la valence de l’expérience tactile. Nous discutons des implications de cette recherche pour les détaillants en ligne et traditionnels, ainsi que pour la recherche tactile et la recherche sur les effets de dotation. 2003, the Illinois state attorney general’s office issued a warning for holiday shoppers to be cautious of retailers who encourage them to hold objects and imagine the objects as their own when shopping. The basis of this warning was presumably that the combination of physically holding the object and ownership imagery may lead to unplanned or unnecessary purchases. Research on the sense of touch or haptics has increased in the marketing literature, possibly encouraged by the rise of online shopping where marketers are interested in how to compensate consumers for touch when it is unavailable (Peck and Childers 2007). Previous research in marketing has examined product category differences and found that some product categories encourage touch more than others (e.g., Grohmann, Spangenberg, and Sprott 2007; McCabe and Nowlis 2003; Peck and Childers 2003a). The sense of touch excels at obtaining texture, hardness, temperature, and weight information (Klatzky and Lederman 1992, 1993). L’expérience sensorielle joue un réelle rôle dans le choix de l’achat mais également dans le choix entre différentes marque. Nous avons pu voir que le toucher était particulièrement important dans l’acte d’achat. Les consommateurs seront plus motivés à toucher le produit avant de l’acheter pour vérifier les informations d’attributs spécifiques. De plus, l’expérience de toucher un objet et si la sensation est agréablement validé, cette dernière peut avoir une influence sur la persuasion, même si l’élément tactile ne fournit aucune information sur le produit. Sen and Johnson (1997) did not manipulate perceived ownership of an object but did manipulate possession. They used coupons for restaurants and found that having a coupon for a product influenced preference for that option. Nous avons pu remarquer que la valeur d’un objet augmente une fois qu’il en est devenu propriétaire, constat connu sous le nom d’effet de dotation. De plus, la possibilité de toucher peut augmenter les achats non planifiés. D’une autre façon, les individus peuvent se sentir propriétaires d’un objet sans le posséder réellement : la propriété psychologique. C’est le sentiment que quelque chose est «mien». Par exemple, les employés d’une organisation peuvent développer un sentiment de propriété à l’égard de l’organisation ou les client d’une marque peuvent développer un sentiment de propriété à l’égard de l’organisation. Un autre exemple, le football quand les supporteurs disent « mon équipe a gagné ». Il ressente un sentiment de propriété envers l’organisation. Endowment effect research also provides some evidence that receiving objects perceived as unpleasant leads to a negative affective reaction toward the object, as evidenced by lower valuation. For example, Lerner, Small, and Loewenstein (2004) found that an individual’s negative emotional state (such as disgust or sadness) can lower valuation for endowed objects, and work on possession loss aversion (Brenner et al. 2007) shows lower selling prices for negative items. Finally, our research supports Captain Jean-Luc Picard’s claim that “For humans, touch can connect you to an object in a very personal way.” In four studies, we found that mere touch does connect a person to an object by increasing the feeling of ownership of the object. Nous avons remarqué que lorsque la propriété réelle était absente, le contact avec un objet entraînait une perception accrue de la propriété. De plus, le simple toucher peut accroître la perception de propriété pour les acheteurs ou les non propriétaires et pour les vendeurs ou les propriétaires mais également connecte une personne à un objet en augmentant le sentiment. de propriété de l’objet. Ariely, Dan, Joel Huber, and Klaus Wertenbroch (2005), “When Do Losses Loom Larger than Gains?” Journal of Marketing Research, 42 (May), 134–38. Ariely, Dan and Itamar Simonson (2003), “Buying, Bidding, Playing, or Competing? Value Assessment and Decision Dynamics in Online Auctions,” Journal of Consumer Psychology, 13, 113–23. Becker, Gordon M., Morris H. DeGroot, and Jacob Marshak (1964), “Measuring Utility by a Single-Response Sequential Method,” Behavioral Science, 9 (July), 226–32. Beggan, James K. (1992), “On the Social Nature of Nonsocial Perception: The Mere Ownership Effect,” Journal of Personality and Social Psychology, 62 (2), 229–37. Brenner, Lyle, Yuval Rottenstreich, Sanjay Sood, and Baler Bilgin (2007), “On the Psychology of Loss Aversion: Possession, Valence, and Reversals of the Endowment Effect,” Journal of Consumer Research, 34 (October), 369–76. Carmon, Ziv and Dan Ariely (2000), “Focusing on the Forgone: How Value Can Appear So Different to Buyers and Sellers,” Journal of Consumer Research, 27 (December), 360–70. Carmon, Ziv, Klaus Wertenbroch, and Marcel Zeelenberg (2003), “Option Attachment: When Deliberating Makes Choosing Feel Like Losing,” Journal of Consumer Research, 30 (June), 15–29. Childers, Terry L., Michael J. Houston, and Susan E. Heckler (1985), “Measurement of Individual Differences in Visual versus Verbal Information Processing,” Journal of Consumer Research, 12 (September), 125–34. Derbaix, Christian (1995), “The Impact of Affective Reactions on Attitudes toward the Advertisement and the Brand: A Step toward Ecological Validity,” Journal of Marketing Research, 32 (November), 470–79. Dhar, Ravi and Klaus Wertenbroch (2000), “Consumer Choice between Hedonic and Utilitarian Goods,” Journal of Marketing Research, 37 (1), 60–71. Franciosi, Robert, Praveen Kujal, Roland Michelitsch, Vernon Smith, and Gang Deng (1996), “Experimental Tests of the Endowment Effect,” Journal of Economic Behavior and Organization, 30 (August), 215–26. Furby, Lita (1978), “Possessions in Humans: An Exploratory Study of Its Meaning and Motivation,” Social Behavior and Personality, 6 (1), 49–65. ——— (1980), “The Origins and Early Development of Possessive Behavior,” Political Psychology (Spring), 30–42. Grohmann, Bianca, Eric R. Spangenberg, and David E. Sprott (2007), “The Influence of Tactile Input on the Evaluation of Retail Product Offerings,” Journal of Retailing, 83 (2), 237– 46. Isaacs, Susan (1933), Social Development in Young Children, London: Routledge. Johnson, Eric J., Gerald Ha¨ubl, and Anat Keinan (2007), “Aspects of Endowment: A Query Theory of Value Construction,” Journal of Experimental Psychology: Learning, Memory, and Cognition, 33 (3), 461–74. Johnson, Eric J., John Hershey, Jacqueline Meszaros, and Howard Kunreuther (1993), “Framing, Probability Distortions, and Insurance Decisions,” Journal of Risk and Uncertainty, 7, 35–51. Kahneman, Daniel, Jack L. Knetsch, and Richard Thaler (1990), “Experimental Tests of the Endowment Effect and the Coase Theorem,” Journal of Political Economy, 99 (December), 1325–48. Klatzky, Roberta L. and Susan J. Lederman (1992), “Stages of Manual Exploration in Haptic Object Identification,” Perception and Psychophysics, 52 (6), 661–70. ——— (1993), “Toward a Computational Model of Constraint Driven Exploration and Haptic Object Identification,” Perception, 22, 597–621. Knetsch, Jack L. and Jack A. Sinden (1984), “Willingness to Pay and Compensation Demanded: Experimental Evidence of an Unexpected Disparity in Measures of Value,” Quarterly Journal of Economics, 99 (August), 507–21. Krishna, Aradhna (2006), “Interaction of Senses: The Effect of Vision versus Touch on the Elongation Bias,” Journal of Consumer Research, 32 (March), 557–65. Krishna, Aradhna and Maureen Morrin (2008), “Does Touch Affect Taste? The Perceptual Transfer of Product Container Haptic Cues,” Journal of Consumer Research, 34 (6), 807–18. Lerner, Jennifer S., Deborah A. Small, and George Loewenstein (2004), “Heart Strings and Purse Strings: Carryover Effects of Emotions on Economic Transactions,” Psychological Science, 15 (5), 337–41. McCabe, Deborah Brown and Stephen M. Nowlis (2003), “The Effect of Examining Actual Products or Product Descriptions on Consumer Preference,” Journal of Consumer Psychology, 13 (4), 431–39. Morewedge, Carey K., Lisa L. Shu, Daniel T. Gilbert, and Timothy D. Wilson (2006), “Owning, Not Loss Aversion, Causes the Endowment Effect,” working paper, Social Psychology Department, Harvard University, Cambridge, MA. Nayakankuppam, Dhananjay and Himanshu Mishra (2005), “The Endowment Effect: Rose-Tinted and Dark-Tinted Glasses,” Journal of Consumer Research, 32 (2), 390–95. Novemsky, Nathan and Daniel Kahneman (2005), “The Boundaries of Loss Aversion,” Journal of Marketing Research, 42 (May), 119–28. Peck, Joann (2009), “Does Touch Matter? Insights from Haptic Research in Marketing,” in Sensory Marketing: A Confluence of Psychology, Neuroscience and Consumer Behavior Research, ed. Aradhna Krishna, New York: Psychology Press/ Routledge. Peck, Joann and Terry L. Childers (2003a), “To Have and To Hold: The Influence of Haptic Information on Product Judgments,” Journal of Marketing, 67 (April), 35–48. ——— (2003b), “Individual Differences in Haptic Information Processing: The ‘Need for Touch’ Scale,” Journal of Consumer Research, 30 (December), 430–42. ——— (2006), “If I Touch It I Have to Have It: Individual and Environmental Influences on Impulse Purchasing,” Journal of Business Research, 59, 765–69. ——— (2007), “Effects of Sensory Factors on Consumer Behaviors,” in Handbook of Consumer Psychology, ed. Frank Kardes, Curt Haugtvedt, and Paul Herr, Mahwah, NJ: Erlbaum. Peck, Joann and Jennifer Wiggins (2006), “It Just Feels Good: Customers’ Affective Response to Touch and Its Influence on Persuasion,” Journal of Marketing, 70 (4), 56–69. Pierce, Jon L., Tatiana Kostova, and Kurt T. Dirks (2001), “Towards a Theory of Psychological Ownership in Organizations,” Academy of Management Review, 26 (2), 298–310. ——— (2003), “The State of Psychological Ownership: Integrating and Extending a Century of Research,” Review of General Psychology, 7 (1), 84–107. Rottenstreich, Yuval and Suzanne B. Shu (2004), “The Connections between Affect and Decision Making: Nine Resulting Phenomena,” in The Blackwell Handbook of Judgment and Decision Making, ed. Derek Koehler and Nigel Harvey, Oxford: Oxford University Press, 444–63. Rudmin, Floyd W. and John W. Berry (1987), “Semantics of Ownership: A Free-Recall Study of Property,” Psychological Record, 37 (22), 257–68. —— (2006), “Learning through Virtual Product Experience: The Role of Imagery on True versus False Memories,” Journal of Consumer Research, 33 (3), 377–83. Sen, Sankar and Eric J. Johnson (1997), “Mere-Possession Effects without Possession in Consumer Choice,” Journal of Consumer Research, 24 (June), 105–17. Shiv, Baba and Alexander Fedorikhin (1999), “Heart and Mind in Conflict: The Interplay of Affect and Cognition in Consumer Decision Making,” Journal of Consumer Research, 26 (December), 278–92. Strahilevitz, Michal A. and George Loewenstein (1998), “The Effect of Ownership History on the Valuation of Objects,” Journal of Consumer Research, 25 (December), 276–89. Thaler, Richard (1980), “Toward a Positive Theory of Consumer Choice,” Journal of Economic Behavior and Organization, 1, 36–90. ——— (1985), “Mental Accounting and Consumer Choice,” Marketing Science, 4 (3), 199–214. Wolf, James R., Hal R. Arkes, and Waleed A. Muhanna (2005), “Is Overbidding in Online Auctions the Result of a PseudoEndowment Effect?” working paper, Social Science Research Network.